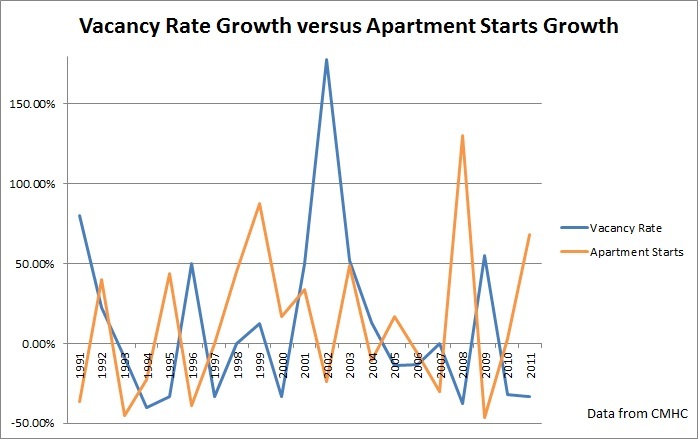 Does a Low Vacancy Rate Mean No Condo Crash? It is often said that you should not worry about a condo market crash in Toronto because of the very low rental vacancy rate, currently standing at 1.7%. But does a low vacancy rate really serve as a firewall for Toronto's condo market? 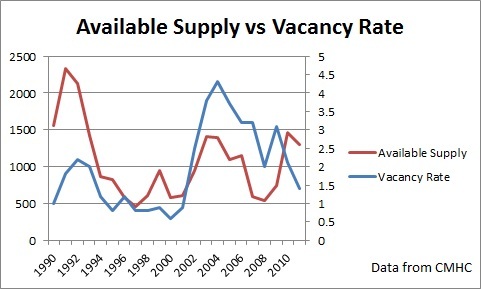 What the above graph tells me is that as the real estate appreciation accelerates, vacancy rates go up. 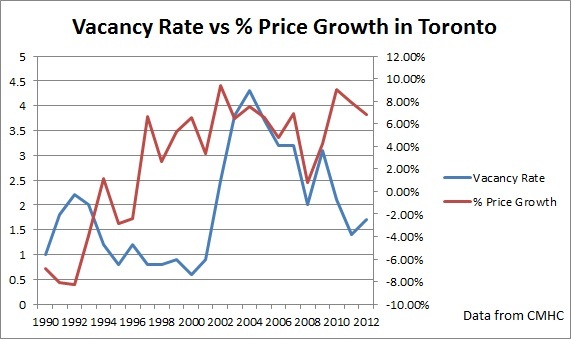 This is based on a medium correlation of "0.3" between the vacancy rate and the price change over the span of 22 years. This is completely opposite of what is happening in Vancouver and very unexpected. So I dug further. Keep in mind that correlation is not causation. 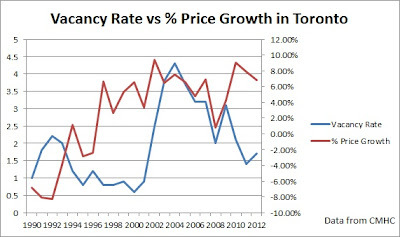 If you examine the graph above you can see that between 2001 and 2002 the rental vacancy rate in Toronto had jumped from 0.9% to 2.5%. This is a huge increase in the vacancy rate which completely changed the relationship between the two variables. Prior to 2001 the correlation was "-0.74". 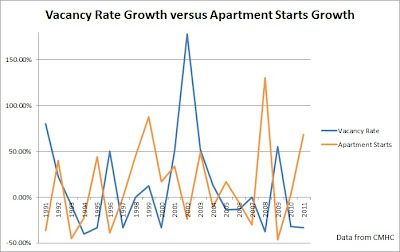 In other words, between 1990 and 2000, the price growth accelerated as the vacancy rate decreased - just like in Vancouver. As the new supply hit the market a few years later, the vacancies also went up. It is plausible to conclude that the increased supply played the biggest role in the vacancy rate jumping between 2001 and 2002. Currently there are over 50,000 apartment units under construction. Imagine what that will do to the vacancy rate. Can't imagine? Let me help you! Take a look at the two yellow boxes in the chart below. 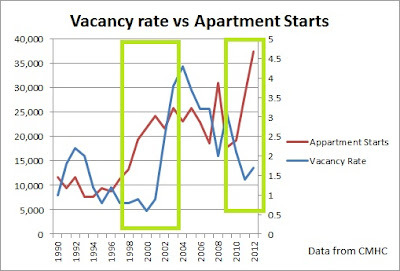 Notice how in the first box the vacancy rate (in blue) increased following the spike in the apartment starts (in red). Now look at the second box and tell me - what do you think is going to happen next? 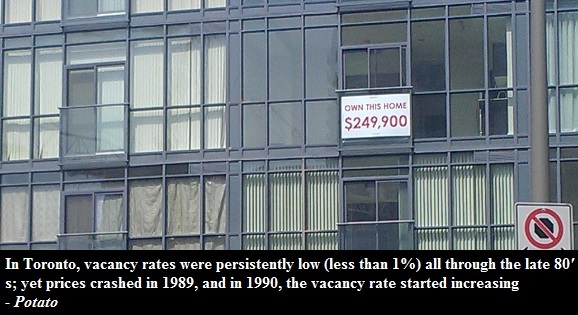 I am not convinced that the low vacancy rate is going to prevent or even ease the oncoming correction in condo prices. Firstly, the relationship between the price change and the rental vacancy rate is both non causal and all over the place. Secondly, if anything, it is very likely that the vacancy rate is going to increase substantially in the coming years due to the new supply. Finally, if you are still not convinced, Ben Rabidoux pointed out that vacancy rates in Miami only started rising after the start of the housing crash.